Daughter of Mary Josephine (Barron) and Thomas Christopher O’Dwyer, Sr., Mary Jo grew up in North Cambridge and attended local schools. Following the sudden death of her father, a World War II veteran, she decided to join the Navy Nurse Corps in 1967. With a Navy Nurse Corps officer candidate scholarship, she was able to study for her BS degree in Nursing at St. Anselm’s College in Manchester, New Hampshire. After graduation in 1969, she was assigned to the naval hospital in Memphis Tennessee where she cared for injured servicemen returning from Vietnam. From there, she was assigned to a hospital in Naples, Italy until her release from active service in 1973. 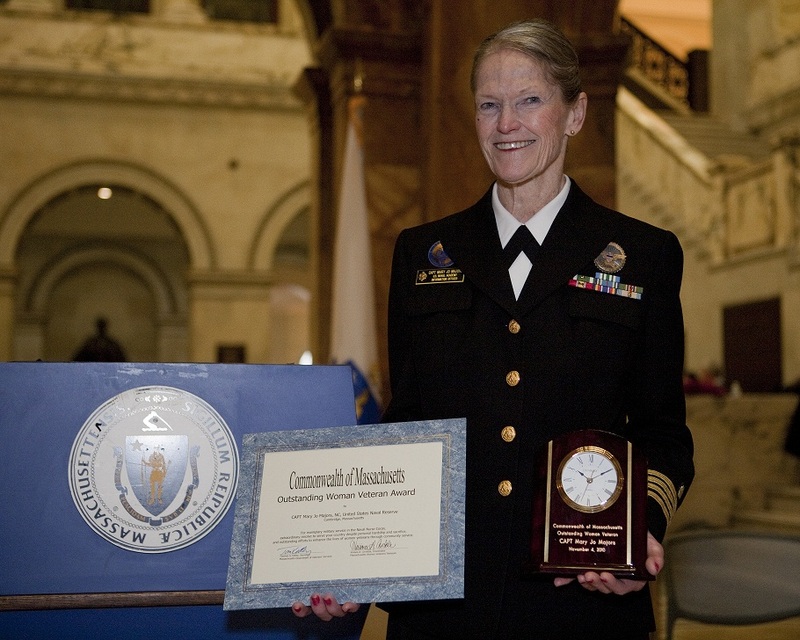 As a reserve officer, then Lieutenant Majors, continued her education and obtained the degree Master of Science in Nursing as a Clinical Specialist in Medical Surgical Nursing at Boston University in 1977. Following this, she held many important positions. She was Director of Nursing Services and Director of Training for a Naval Reserve Fleet Hospital in Florida, and held assignments in the offices of the Director of the Navy Nurse Corps, the Director of the Naval Reserve, and at the Bureau of Medicine and Surgery and the Bureau of Naval Personnel. During the Gulf War (Operation Desert Shield and Storm), she served on special active duty as the first Reserve Special Assistant to the Chief Nurse at the National Naval Medical Center in Bethesda, Maryland where she assisted with the deployment of active duty staff to the Navy Hospital Ship Comfort and oversaw the staffing of the hospital by medical reservists. From 1997-98, she was assigned to the office of an Assistant Secretary of Defense in the Pentagon, where she worked to improve medical and dental benefits for military service reservists and retirees. Captain Majors retired from the Navy in March 2011 and now serves as a volunteer as the Command Ombudsman for the Naval Operations Support Center in Quincy, MA. She has served as a mentor to countless young women and men at various stages in their military careers. She volunteers as the Navy Nurse Corps Advisor to the Navy Nurse Corps Option Midshipmen in the Boston Naval Reserve Officers Training Corps Consortium; as an interviewer for the Navy Recruiting District New England Officer Programs; as an Admissions Information Officer for the US Naval Academy to assist the admissions office with prospective high school and college students; and as an advisor and support staff to the medical department staff and crew of the USS Constitution. Her military awards include the Meritorious Service Medal, the Joint Service Commendation Medal, the Navy and Marine Corps Commendation Medal, the Joint Service Achievement Medal, Meritorious Unit Commendation, National Defense Service Medal, Global War on Terrorism Medal, and the Armed Forces Service Medal. She has continued an active civilian life working at the South Cove Community Health Center in Boston, an organization that serves over 25,000 primarily Asian patients with limited income and resources. Here she has taken on the task of Director of Clinical Operations/Director of Nursing/Emergency Preparedness Coordinator, Quality Assurance and Quality Improvement Coordinator, and is the Coordinator of the bone density program. Captain Mary Jo Majors was honored in November 2010 as the “Outstanding Woman Veteran of the Year” by the Massachusetts Department of Veterans’ Services at the State House where Cambridge Mayor David Maher presented her with a City Council resolution and a key to the city. Captain majors was recognized as the "2012 Alumni Humanitarian of the Year" by St. Anselm College in Manchester, New Hampshire and by the Boston Red Sox as an outstanding military service member in June of 2012. The Massachusetts Daughters of the American Revolution (DAR) awarded Capt. Majors with its 2013 Outstanding Veteran Volunteer Award at a ceremony in March. She was selected for the award from a group of 40 candidates from each of the 40 DAR chapters in the state. In March 2014, she received the "Patriot's Award" from the Ahern Family Charitable Foundation, the first woman and first woman veteran to receive the award. Veterans Services Department, City of Cambridge. http://www.cambridgema.gov/mayor/newsandpublications/massachusettsassociationofwomenveteranshonorscaptainmaryjomajors.aspx from web January 4, 2011.
http://www.scchc.org/Providers/Providers_.htm from web January 4, 2011. Helen Deane Markham was brought up in Springfield, MA, where she attended the public schools. She graduated from Wellesley College, then attended Brown University to pursue a graduate degree in biology, and took her Ph.D. in 1943. She spent the following year as a lecturer at McGill University and came to live in Cambridge in 1944 and work in the Department of Anatomy at Harvard Medical School. Helen was the first female instructor and later the first female professor in the department. She did notable tissue research while in the department, collaborating with Roy O. Greep, who became dean of Harvard's Dental School. She married George Markham in 1947. The couple was involved in various humanitarian endeavors. While an assistant professor at Harvard, her husband was the Progressive Party candidate for state representative. Dr. Markham became the victim of McCarthy red-baiting at Harvard in 1953, when she was called before the Jenner Committee. She was then denied tenure at Harvard and her position was terminated. She returned to Harvard later to work with Professor Alexander Forbes on visual mechanismas at the Biological Laboratories. In 1957, Dr. Markham went to the Albert Einstein School of Medicine, where she rose to the rank of full professor. She became recognized as a distinguished histochemist, doing significant work on the adrenal glands and ovaries, and publishing 147 journal articles. (Histochemistry is a biological science that uses various methods to identify certain cell or tissue structures on a microscopic level.) She was a founding member of the Histochemical Society. She died of breast cancer at the age of 49. Her husband, George F. Markham, died on October 25, 2009 at the age of 100. Greep, Roy O.“Professor Helen Wendler (Deane) Markham, 1917-1966” Journal of Histochemisty and Cytochemisty v. 14, no. 12, pp. 881-3, 1967. Family records of James G. Deane. Markham, Helen Deane. Papers, 1941-1968. Schlesinger Library, Hollis Library Catalog summary of archival collection. Dr. Helen Deane Markham at Harvard Medical School. Photo courtesy of James G. Deane. Lorna Marshall wrote important studies on the !Kung tribe of Africa. She graduated with an English degree from the University of California, Berkeley, then taught English at Mount Holyoke College. In the 1920s, she married Lawrence Marshall, a co-founder of Raytheon Corporation, and settled in Cambridge, where they lived for many years. While her husband worked on magneton tubes used in radar for US and Allied ships during World War II, she helped integrate the Raytheon production lines. In 1949, near the retirement of her husband from the company, the couple with their two children went to study the !Kung, a hunter-gatherer tribe in the Kalahari desert in southern Africa, the trip being sponsored by Harvard’s Peabody Museum. Lorna began to seriously study anthropology and produce scholarly papers. Lorna’s teenage son, John, began to film her interviews and eventually became an acclaimed anthropological documentary filmmaker. Over a period of two decades, Lorna Marshall spent more time in Botswana and Namibia than she did in Cambridge, developing close personal ties to the !Kung. She published two well-received monographs, !Kung of Nyae Nyae (1975) and, when she was in her late nineties, Nyae Nyae !Kung Belief and Rites (1999). Lorna Marshall spent the last years of her life near her daughter in Peterborough, New Hampshire. Schlesinger holds a diary of Lorna Marshall that includes planning for dinners, including a manuscript cookbook. Her expedition diaries are held at Peabody Museum, Harvard University. Her daughter, Elizabeth Marshall Thomas, Her daughter also became a serious student of anthropology. Only nineteen when she first went with her mother to Africa, Thomas continued her mother’s work. As early as 1959, in her late twenties, Thomas published a study of the group, The Harmless People, which was highly praised. More recently, she has branched out into fictional accounts of stone-age people and an updated account of her early field work with her family in The Old Way, a Story of the First People (2006). Genevieve McGlinchey Mathison, circa 1994 age 83. Genevieve McGlinchey Mathison was the daughter of Sarah Clarke (1876-1959) and James J. McGlinchey (1872-1932) both of Cambridge, Massachusets. From 1918 until 1945 her home was at 9 Athens Street, near Harvard Square. As a young person she helped raise funds for the construction of St. Paul’s Catholic Church on Mt. Auburn Street. Genevieve graduated at the top of her class at St. Paul’s School in 1924 and entered Cambridge Latin where she enjoyed academics as well as sports, music, and dancing. She attended Radcliffe College from 1928-1932 and majored in chemistry under James Bryant Conant, who would later become President of Harvard. Genevieve was very active in campus life at Radcliffe including roles as President of the Science, Exchange Editor for the Radcliffe News Daily, and member of the Radcliffe Orchestra. Professor Paul Buck urged Genevieve to run for the Cambridge School Committee after her graduation from Radcliffe in 1932. At the age of 21, she ran a campaign in the 1933 primary garnering her 11th place in the race with a total of 2,808 votes out of nearly 16,000 cast. Genevieve was the sole support for her mother, aunt and two sisters. Her income financed the Radcliffe education of her sisters Grace and Anne. Due to the Depression, Genevieve’s degree in science did not lead to the types of jobs that provided much income. She worked at the Cambridge Neighborhood House, the Registry of Motor Vehicles, Boston City Hospital, and as a substitute teacher for six years in the Cambridge public schools. From 1938 through 1939 she taught at the Webster School and from 1939 through 1942 she was a physics instructor at Cambridge High and Latin. During these years she was hard at work on her M.S. in physics from Boston College. During World War II she worked at Converse Laboratory, Harvard University, assisting Robert Woodward with his work on synthetic quinine; Woodward was awarded the Nobel Prize in Chemistry in 1965. From 1943-1945, she contributed to the study of K-band radar at the Radiation Laboratory of M.I.T., working with Edward M. Purcell, who earned the Nobel Prize in Physics in 1952. For a brief time after her marriage to fellow physicist William Wallace Mathison (1913-1988), the couple lived in California where she worked as a physicist at the Naval Ordnance Test Station to improve the guidance system for the Sidewinder missile. She and Mathison had three daughters, Sarah Ann (1945), Marian Alice (1947), and Genevieve Elizabeth (1951), all of whom went on to careers in teaching. In 1951, the family returned to the east coast to live in Newport, Rhode Island. Genevieve and William both worked at the Naval Underwater Ordnance Station. She became the station’s first female engineer and worked on testing and improving torpedoes. She was the first woman science department chair at Rogers High School in Newport. When she was in her seventies she was elected to the Newport School Committee, a position in which she served from 1981-1982 and again from 1986-1994. 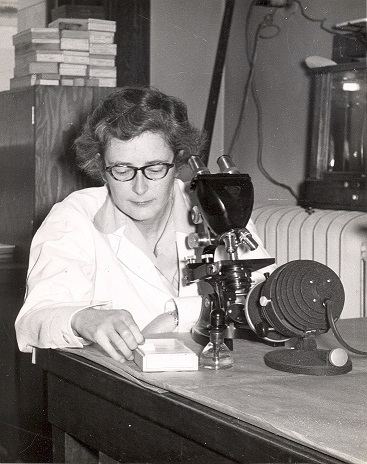 As Secretary of the Newport Engineering Society in 1952, she initiated the first scholarships for young women in science. As the President of the Aquidneck Island Council of PTAs in the 1950s, she initiated a decade long program with the American Lung Association to test school age children for tuberculosis. Genevieve McGlinchey Mathison died of cancer in 2004 at the age of 93. Desrosiers, Marian. Nomination to the Cambridge Women’s Heritage Proect. Farragher, Thomas. “Genevieve M. Mathison, 93; pioneering scientist helped improve radar,” The Boston Globe, May25, 2004. Daughter of Gilman and Celenda S. Hatch, Estelle attended the local public schools in Jefferson, Maine until she was fourteen, when she matriculated at Wheaton seminary in Norton, Massachusetts. After three years, she returned to teach in Jefferson and after two years more, moved to the Boston area. She taught in the public schools of the Hyde Park neighborhood for three years and established a business training course there. She decided to study botany which had always interested her, and attended courses at Radcliffe College (then called the “Harvard Annex”) and also studied privately in hopes of teaching botany in a woman’s college. She also began to publish articles in the Boston Transcript under the name of “Jean Kinkaid”. After a bout of illness, she had to drop out of public school teaching but continued to write newspaper articles for both the Transcript and the Boston Globe which soon accepted her as a regular journalist. In October 1887, she married Samuel Merrill, an editor at the Globe, and the couple moved to Cambridge where she continued to write for the paper and to participate in community affairs. She was a founding member and president of the Cantabrigia Club, and lectured on current events before the organization. She also served as an officer of the Associated Charities of Cambridge and other associations. She was a charter member of the New England Women’s Press Association for which she was the first secretary and in 1891 served as its president. In 1894, she started a magazine to further the New England kitchen movement in a magazine entitled The New-England Kitchen sponsored by the Household Economic Association. She co-edited a new magazine, American Motherhood with Dr Mary Wood-Allen that emphasized home-making and advice to women in the late 1890s that continued until 1909 or later. In 1905, she established an insurance company in Boston, the American Birth Insurance Company, the first insurance company to cover births. She organized the company with other women with the intent of combining philanthropy with business, but the company went bankrupt two years later. She and her husband were listed as living at 45 Bellevue Avenue in Cambridge in the 1904 edition of the Blue Book of Cambridge. Julia Ward Howe, Editor, Representative Women of New England, 1904. Jennie Cunningham Croly, The History of the Woman’s Club Movement in America, 1898. Blue Book of Cambridge, Cambridge MA, 1904. ”Birth Insurance attacked” New York Times, May 11, 1906. Born to Charles Edward Mongan, a well-to-do physician, and Elizabeth Teresa (O'Brien), Mongan attended the Cambridge School (for Girls) and then went to Bryn Mawr College, where she studied art history and English literature, graduating in 1927. The following year she studied Italian art in a Smith College seminar that studied in Florence, Northern Italy, Paris, and Central Europe. She returned to Cambridge, where she lived for the rest of her life, earning her master's degree from Smith College in 1929. That year she began to work at the Fogg Art Museum as a research assistant under Paul Sachs, preparing a catalogue of his collection of drawings. She soon became an important part of the museum and from 1937 to 1947 her title was Keeper of Drawings. By 1947 she was named Curator of Drawings, the first woman to be named curator at the Fogg, retaining this title until her retirement in 1975. She was also an important administrator of the museum. Between 1951 and 1968, she rose from Assistant Director of the Fogg, to Associate Director, then Acting Director. From 1969 to 1971 she served as Director of the Fogg Museum, retiring in 1971, but retaining her position as Curator of Drawings for a further four years. She produced a number of important catalogues, including: Drawings in the Fogg Museum of Art (1940), The Ingres Centennial Exhibition, 1867-1967 (1967), One Hundred Master Drawings, presented in honor of Paul J. Sachs (1949), and David to Corot: French Drawings in the Fogg Museum of Art (1996). Agnes Mongan was visiting professor and visiting curator at a number of universities and museums, and was awarded honorary degrees from Smith, Wheaton, Colby, University of Notre Dame, and Boston College. Harvard honored her by opening the Agnes Mongan Center for the Study of Prints, Drawings, and Photographs. She died in Cambridge at the age of ninety-one. Her papers are held in the Harvard Art Museum archives, Harvard University. References: Biography of Agnes Mongan, Agnes Mongan papers, Harvard Art Museum Archives; Harvard University Gazette, September19, 1996. Dorothea Moore was the daughter Edward Caldwell Moore and Eliza Coe (Brown) Moore. Her father was a minister in the Congregational Church in Rhode Island until he was appointed a professor at Harvard in philosophy and theology. She attended attended the Gilman School in Cambridge and then a private school in Boston. She graduated from Byrn Mawr College in 1915 and when she was a senior she decided to become an MD. She attended Radcliffe Graduate School to prepare, took classes at Harvard Medical School (which still did not admit women into the regular program), completing her medical degree at Johns Hopkins Medical School in 1922 after working during World War I as a laboratory technician in bacteriology at an American Red Cross hospital in France. Moore interned at Bellevue Hospital and worked in the clinics of the obstetrical department of New York State Department of Maternity, Infancy and Child Hygiene. In 1925, she was appointed as the first woman intern at New York Nursery and Child's Hospital in New York where she contracted diphtheria. Forced to recuperate for a year, she returned to intern in a pediatric department of University Hospital in Rochester. She then taught for a year at Yale Medical School, and then held a research position at Cornell Medical School before returning to Cambridge to practice. In 1934, she established a successful thirty-year private practice in Cambridge and became an active member of the Child Care Association, the Head Start Program, and monthly well-child conferences in southern Massachusetts. She practiced also in the outpatient clinics of Children’s Hospital in Boston and taught pediatrics at Harvard Medical School from 1937-1968. She was a fellow of the American Association of Pediatrics. In 1941, she married Arthur Burkhard, a professor of German literature but continued to practice under her own name. She published many articles in pediatric journals. From 1955 to 1985, she sat on the board of directors of the Cambridge Mental Health Association, retiring at the age of ninety. She died eleven years later, at 101. References: Schlesinger Library: Papers of Dorothea May Moore; Obituary (as Dorothea Moore Burkhard) AAP (American Academy of Pediatrics) News Vol. 12 No. 2 February 1996, p. 25. Born in New York City, Maud Cabot graduated from Barnard College in 1926 and traveled to Paris to study at the Sorbonne. She did not begin to paint until she was twenty-four when she met her future husband, the artist Pat Morgan, in the late 1920s in Paris. In 1929, the couple moved back to New York, where she studied at the Arts Student League under Kimon Nicolaides. She then studied with Hans Hofmann and began to exhibit at galleries in New York. In 1938 she had a successful show at the Julian Levy Gallery, during which some of her paintings sold to the Whitney Museum, the Metropolitan Museum of Art, and the Museum of Modern Art. In 1940 she and her husband moved to Andover, MA, where he taught art at Phillips Academy, and she began to teach at the nearby girls’ boarding school, Abbot Academy. The couple had two children. In 1957 she separated from her husband and moved to Boston, then, a few years later, to Cambridge, where she lived and painted for the rest of her life. She continued to exhibit in New York, primarily at the Betty Parsons Gallery, where she was included in joint exhibitions with Jackson Pollock, Mark Rothko, Robert Motherwell, and other notable contemporary artists. Morgan had two retrospective exhibitions, 1967-1968 at the Fitchburg (Massachusetts) Art Museum, and 1977 at the Addison Gallery of American Art. In 1970, after her divorce was final, she spent six months in Africa. She returned to Cambridge and lectured on art at Harvard and MIT and taught at Lesley College’s Institute for the Arts and Human Development. In 1980 a film about Morgan’s art, “Light Coming Through,” was produced by Rickie Leacock, the head of the MIT film department. The film premiered at the Museum of Fine Arts, Boston, and was later shown at the Museum of Modern Art (MOMA) in New York and the Place Pompidou in Paris. In her eighties and nineties, she continued painting, displaying continuing creativity. She received an Honor Award in 1987 from the Women's Caucus for Art. Since 1993 the Museum of Fine Arts, Boston, which holds a number of her significant paintings, has awarded the Maud Morgan prize yearly to a mid-career woman artist. In 1995, at the age of ninety-two, she published an autobiography, Maud’s Journey: A Life From Art. She died four years later in Cambridge. Plans have been made to create an art museum and gallery in her honor in the carriage house behind the Agassiz Community Center at 20 Sacramento Street, Cambridge. Kathleen (Kay) (Johnston) Morrison was born in Nova Scotia ca 1900. She was raised in Philadelphia where she attended Miss Hill’s school. She did her undergraduate work at Bryn-Mawr College where she was editor and chief of the student paper. She met Robert Frost in 1918 at the college and invited him to lecture there when she was a senior in 1920. Kay again met Robert Frost when a colleague of Ted’s, Bernard DeVoto, brought Frost into the Harvard circle and the Cambridge area. Robert Frost and the Morrisons became close friends. Kay, Ted and Robert Frost continued their friendship throughout their lifetime. It is said they “made up a family of sorts.” (Parini, 315). Ted Morrison was Director of the Bread Loaf Writers’ conference at Middlebury College from 1932 – 1955. In the summer of 1939, Frost purchased the Homer Nobel Farm in Ripton, Vermont close to the College. During the summers, Robert Frost would reside in the cabin on the farm and the Morrison’s would stay in the farm’s main house. Books and Writers website, Robert (Lee) Frost (1874-1963). 2002. Found on May 31, 2008 at http://www.kirjasto.sci.fi/rfrost.htm. Parini, J. (1999). Robert Frost: a life. Fistzhenry & Whiteside Ltd., Markham, Ontario. Phylis Morrison was born Phylis Hagen. She married and had one son, Bert Singer, but the marriage did not last. Self taught as an artist and weaver, she began to teach others, becoming convinced that art and science were the same. In 1960, she published a book on crystals with Alan Holden for the Science Study series. In 1965 she met the distinguished physicist and peace activist Philip Morrison at an education program connected with MIT. The two married and became an inseparable couple. When he began to serve Scientific American as book editor, Phylis joined him in reviewing children’s science books for thirty-five years. She also worked with him on the NOVA series “Powers of Ten” for PBS, and worked on the book that arose from that series. The two also collaborated on a later NOVA series “The Ring of Truth” that aired in 1987, also published as a book. She received the Wheeler prize with her husband from the Boston Museum of Science. She died of cancer in 2002. After Philip Morrison’s death in 2005, a website was set up to bring together recollections of the couple.